When it comes to taking stock, the art market can happily say that it is in fine fettle, in the middle of an economic downturn, and even despite it. Of course, not everything is rosy, and some players are not part of the main feast, just savouring an appetiser. But this is no time to complain, when the sector is posting nine-figure results, particularly since the next season – often a worrying time of year for the professionals – already looks well-stocked, especially in Paris. 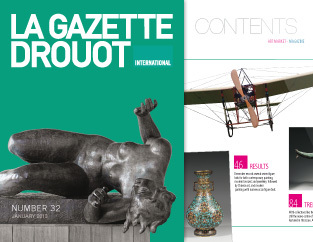 France, which has maintained fourth place in the art market's world ranking, draws its true richness from its diversity, as witness the results for December alone (featured in this issue) and the schedule for 2014. This includes works by Maurice Denis from the former Thomas collection, Pre-Columbian masks, collectors' cars (on offer during the Retromobile fair), and a library of ultra-rare books on architecture, which have not been since the famous Fernand Pouillon sale in Paris – not to mention a sale dedicated to video art at Drouot in January: a first for this medium, the poor relation of contemporary art, which until now has never been part of a thematic sale. In the end, doesn't the real power of a capital in the art market lie in its ability to renew itself? In Paris, the market is raging. 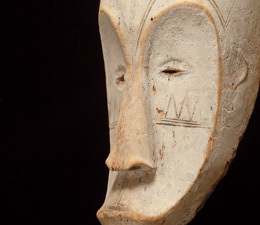 In the top ten bids, Tribal Art is by no means bottom of the list. From nail fetishes to simple ethnographic curiosity, we focus on a few distant beauties. Tribal art, whose very designation is a subject for debate, include works from very different civilisations. The four corners of the earth are represented in this category, with Baule masks, Inuit walrus ivory carvings, necklaces from the Fiji Islands, and so on. The heterogeneousness of the pieces covered by this market and the rarity of certain types of objects mean that great caution is needed when analysing its results. Nevertheless, there has been a steady fall in the sector's activity during the period in question, with only the odd outstanding sale going against the grain. This was the case in June 2006 when the famous Pierre and Claude Vérité collection was dispersed at Drouot. The sale posted a result of €44 M: the largest amount ever achieved in this specialty, with more than eight lots passing the million mark. In Paris on 2 and 3 December, sales devoted to modern and Impressionist art totalled €14,720,885 with the Artcurial- Briest-Poulain-F. Tajan auction house. The nine (out of ten) lots sold from the Dina Vierny collection, in collaboration with Sotheby's, alone garnered €9,326,800, and two world records were set for Aristide Maillol, including an absolute record at €6,177,266 for the lead sculpture "La Rivière". The previous record, $3,085,750 (€4.4 at today's value) went back to 9 November 2000 at Sotheby's New York, with one of six post-1952 proofs of "L'Air, 1937" (l. 238.8 cm). Another bid of over a million rang out during the Monday evening: €1,831,890 for an 1876 oil on canvas by Gustave Caillebotte, "Le Pont de l'Europe" (73 x 60 cm). The estimate for this picture, a preparatory version of the painting now in the Musée du Petit Palais in Geneva, had been changed before the sale to €1.8/2.2 M, as the somewhat sketchy character of some parts had curbed the interest of enthusiasts. As an international art fair, BRAFA cultivates its fundamentally European character with numerous exhibitors from Belgium (38%), Switzerland (80 dealers) and France (46 dealers), joined by various American and Japanese galleries. Each fair provides an opportunity to discover new galleries, which this year include James Bauerle Kunsthandel from Copenhagen, Carpenters Workshop Gallery from London, Cité de la Céramique (Sèvres) and Yann Ferrandin from Paris, not to mention Kovacek Spiegelgasse from Vienna and Costermans from Brussels, celebrating its 175th anniversary during the fair. Some exhibitors, also present at other major events in the market will be coming to cut their teeth. All in all, the menu offers a broad panorama including tribal arts, antique jewellery, Old Masters and modern paintings, sculpture and photography: enough to satisfy and no doubt surprise a clientele of informed art lovers and collectors. Serge Poliakoff (1900-1969) made an instantly identifiable "visual poetry" of his painting. No Paris exhibitions have been devoted to this major artist of the Second Paris School since 1970. The major retrospective at the Musée d’Art Moderne de la Ville de Paris, which brings together a hundred and fifty works from between 1946 and 1969, follows his career chronologically in a staging that truly reflects the essence of his style. It has the merit of clarifying the formal unity of the paintings within a visual exploration that reveals the artist's multiple pictorial solutions. Poliakoff emigrated to Paris in 1923. Primed for abstraction through his meeting with Kandinsky in 1936, then with the Delaunays, and by his admiration for Freundlich, he established himself on the abstract art scene after the First World War. Promoted by Denise René from 1947, he received the Kandinsky prize the same year. The Lega peoples live on the south-east border of the tropical forests of Central Africa, in the Democratic Republic of the Congo. Isolated in a mountainous region covered in dense forest, they were largely ignored by the colonial administration, but since the Congo became independent in 1960, they have suffered enormously in the tumultuous and still on-going history of civil wars. And yet, as their superb artefacts suggest, the Legas' life is imbued with a profound wisdom and a heightened sense of community and the individual. Art plays a fundamental role here: objects are, separately or together, symbols of success, gauges of continuity, tools of apprenticeship and commemorations of the dead.